Note: As part of the Enhancing Youth Literacy course, students are asked to find an “independent act of civic engagement” — to leap into the community and to share their presence, their observation, and/or their voice. Amanda used her volunteer experience with kids at Springwater Commons and her in-class reading/learning to inform her own commenting on several prominent education blogs. How exciting to see her ideas in print alongside those of such important voices! I had really hoped that I would be able to attend a meeting in the community; however that was not able to happen and I chose instead to add my voice to several blogs by posting in the comment sections. This involved a LOT of reading, this might seem tedious but I found myself interested in seeing the commenters personal opinions and sometime the completely, excuse my language, BS opinionated posts by some who you could tell had even less knowledge on the topic then I did. I feel grateful that I chose to take the Enhancing Youth Literacy capstone and was able to at least gain a broad knowledge of some important issues going on in our community and country with our education system. Although it is very “idealistic” and most likely impossible to actually accomplish, I really like this quote from the linkhttp://www.huffingtonpost.com/marian-wright-edelman/ “Leave No Child Behind mission is to ensure every child a Healthy Start, a Head Start, a Fair Start, a Safe Start, and a Moral Start in life and successful passage to adulthood with the help of caring families and communities.” I thought this quote encompassed many of the points we discussed in class. 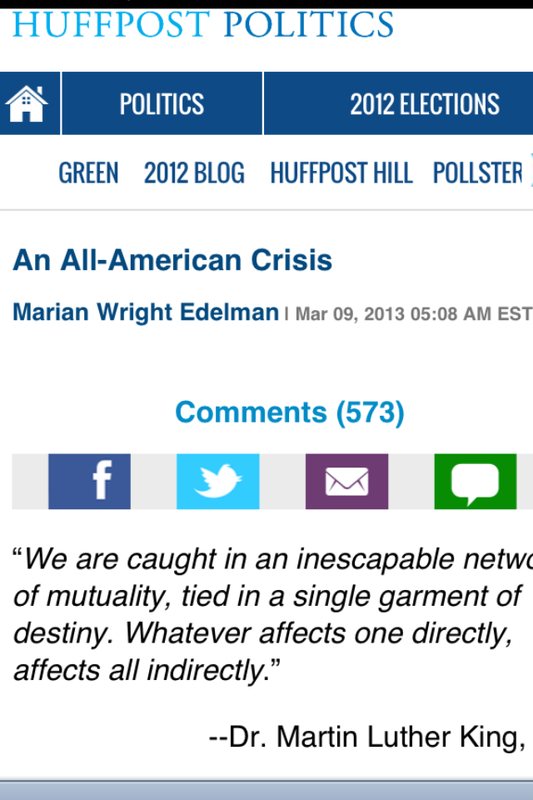 I included a picture of the number of comments left on one of the blog posts from this site, the article is about violence, but I felt that it was important to see the number of people who responded to this post and the title An All-American Crisis. I feel like, especially after reading these education blogs and peoples comments on the subject that we are really undereducated about the issues and that it will become an “All American Crisis”, one that will have an impact on our entire nation. During this course, the topic of charter schools really caught my attention and I spent a long time reading through the blog article http://rethinkingschoolsblog.wordpress.com/2013/03/08/charter-schools-and-the-future-of-public-education/#comment-2262 I didn’t even know what to say at the end of that article. It gave me so many things to think about and reconsider. No one had really commented on this one, but I posted that I had a lot more research to do and this article made some strong points. Seattle, MAP testing, teachers standing up for what they believe in.http://scrapthemap.wordpress.com/comment-page-1/#comment-936 I think this is HUGE! I left a long comment on this blog post in response to a parent who seemed in support of standardized testing. I asked a couple questions and really tried to think about how I would feel if I was a parent or teacher in this situation. The parent talked about how teachers are not coming up with a solution, and she follows her children’s scores and uses it as a scale to know if her children are keeping up or not. This blog seemed to bring out a lot of emotional comments and I’m really glad I took the time to read through this. I am in support of those teachers, and in contrast to what that mother posted, I think the teachers are standing against MAP testing to create change to make those people who create solutions actually create one. I commented on several different sites, and tried to keep them to recent articles so I can go back over the next few days and see if anymore comments have been added (this could be addicting 😉 ). The three sites I listed above where the ones recommended to me and also some of the ones I felt were most relevant and important to our class learning. I too am taking the Enhancing Child Literacy for my Capstone at PSU and i am also very much enjoying the class. It really brings to light some educational issues that i wasn’t aware was taking place in our country. things that i should be aware of so that i can start trying to make a difference. Yet, these issues aren’t that hidden, people just need to be directed to them. by the way, does anyone know what a charter school really is? I keep hearing about them in both positive and negative light, but i don’t have a grasp as to what they are and what they are suppose to be doing. Thank you for sharing these links with us and i hope you continue having fun posting and keeping blogs informed of the knowledge you have acquired.